Saint Sophia Cathedral in Novgorod. Every man realizes his imperfection. During the best moments of his life he makes efforts to overcome it, or at least to rise to a higher step of the values in his conscience. This phenomenon takes place in all spheres – everyday economic life, occupational, creative, religious or spiritual areas, as well as in the sphere of personal relations. This state is expressed sculpturally in my works mostly through the movement of anthropomorphous forms in the upward diagonal direction. 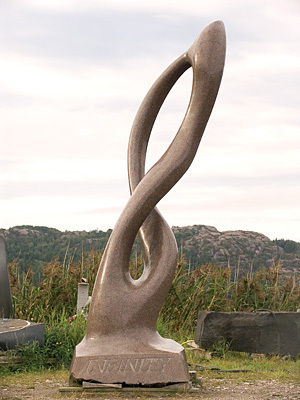 I see the spring of this movement in the constructive principle of the Ancient Greek contrapposto of the figure, understood as a spiral («Steps», 1987, bronze; «Ascension», 1979, bronze, granite; «MYSTERY», 1997-1998, granite; «INFINITY», 2001-2011, granite). The spiral is a universal and perfect model of the universe. It is the architectonic imperative of the animate and nonanimate nature of Cosmos. The heart, the symbol of life, consists, according to the modern concept, of only one muscle shaped in the form of a spiral. The comprising sections of this muscle, contracting in a sequence of a spiral, form the heart cycle. Spiritual processes develop likewise according to the principle of spiral-shaped movement. This is why this kind of movement can serve in sculpture as the symbol of intellectual and spiritual attainments, which affirms their ontological inclusion in the Universum. However, upward movement (or any movement for that matter) is not the absolute symbol of spiritual growth, and it rather conveys active striving for novel aims. The states of destitution and humility, which are highly productive for spiritual and moral development, may be rendered instead by the drooping head and by the restive stooping figure. In actual fact, there is no rest as complete immobility of the form of the creaturely world. What there is is a movement of vectors that is contrasted to the principal manifested movement in the opposite direction of the so-called «restive» form. In composition, similarly to real life, events in the inner world of man often take place simultaneously, which fact enhances their resounding and the polyphony of their meanings. A good example of such a combination of the principles of movement and rest as contrasting within one composition, can be provided by the Alexy Cross of 1380 in the Novgorod St. Sophia of the 12th century. The diagonal rhythm of the intersecting vectors of the streaming-down torso of the Crucified on the one hand, and, on the other hand – the rhythm of the ascending wrists of the spread-out and calling-to-Heaven arms, form, in combination with the drooping head, a polyphonic state of balance, which emphasizes the self-containment of the Spirit. The legs of the contrapposto figure, slightly bending at the knees, enrich the content of the image with impuissance and humility. Adds V. V. Rozanov: «most lofty instances of spiritual enlightenment are unattainable without prior humiliation». 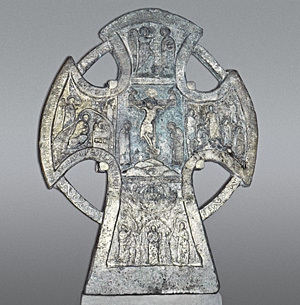 It is my opinion that in crucifixes of this type there is impressed the unique fusion of the Old Russian profession of Christianity and of the popular character (the Alexy Cross, 1380, stone). The drama and the harmony of the spatial and semantic contrasts lead us up to experiencing the aesthetic catharsis and make us party to the lofty moments in the life of the sculpted person («John the Baptist», 1979, bronze; «Pieta», 1991, chamot; «Eternal Path», 1995, marble; «MYSTERY», 1997-1998, granite; «PIETA», 1999-2000, granite).